Would you want a glow-in-the-dark dog? Some medical research mad scientists in Korea recently announced that they had genetically modified a dog to glow in the dark. The beagle Tegon’s special ability is not an always thing. Tegon has to be fed doxycycline in order to glow. I don’t know about beagles, but I’ve had to take doxy antibiotics before and they are completely nauseating and unpleasant. Maybe beagles tolerate them better than I do. The point of a glow-in-the-dark dog is not to create new pets for eccentrics, however. The concept is to demonstrate the ability to manipulate dog genes for the purpose of researching cures to various human diseases. 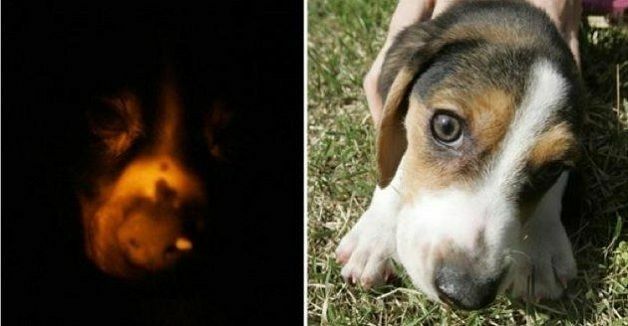 So the glow-in-the-dark beagle is actually the lucky one. If they had a more effective way of the making the dog comfortably fluoresce, however, would you want a cyberpunk genetically-engineered glow-in-the-dark dog or are such things abominations?